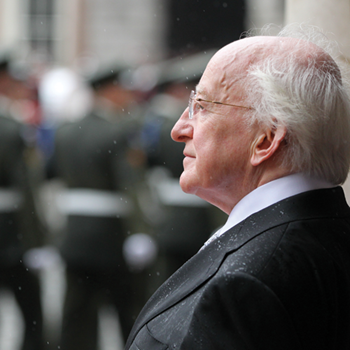 President Michael D Higgins speaks to Meadhbh Monahan about his vision of the republic by 2016 and the actions needed to create a radically inclusive citizenship. A “huge debate” is needed in order to “redefine Irishness” and create the concept of a ‘real republic’ that is “built on ethics and intergenerational solidarity,” President Michael D Higgins tells agendaNi. Following an address to the ICTU women’s biennial conference in Belfast, where he hit out at those who caused the economic crash through their “dangerous obsession” with personal wealth and material possessions, the President insists that “acquisitive individualism” must be replaced by a communal society which is built on ethics. He points to the Thomas Davis lecture series (first broadcast in 1994 and re-broadcast in 2009 to commemorate the 90th anniversary of the first Dáil) which examined the development of the idea of an Irish republic. “The word ‘republic’ has to be something that is inclusive, that is in fact built on ethics and inter-generational solidarity because it isn’t about the Ireland you want for one generation, but the responsibilities that are sustainable [for many generations],” he tells agendaNi. The President contends that while Ireland in the 1890s was “full of idealism”, it became a very conservative society after the 1916 uprising. “For example, the idea of the Proclamation itself [and] the ideals in the democratic programme for the first Dáil [were conservative],” he believes. Irish people have the right to “curse” this “dark period in our economic history” but they also need to “light the candles of hope that will help us to navigate a path towards a better and fairer future,” he told delegates. That vociferous speech came on the back of a hard-hitting address to the National University of Ireland at Dublin Castle in January. On that occasion, the former university lecturer in sociology and politics derided the “culture of individualism” that led to the economic downturn in Ireland. The traditional “warmth of a community of learning” has been “put under threat from the underestimated aggression” that comes from “extreme individualism,” he said. In recognition of the fact that many graduates now face uncertain futures, the President tells agendaNi that his priorities include holding a seminar called ‘Being young and Irish’. It was initially to be called ‘Being young in Ireland’ but was changed because “many Irish have left abroad.” The second seminar is “very important” as is will focus on ethics in every aspect of life. “There is a very fine response. People are very supportive of real ideas,” the President reflects.